This touring microlight is built by P&M Aviation, the company formed by the merging of the UK's two main constuctors - Pegasus and Mainair. Designed by Dr Bill Brookes, it is an excellent touring aircraft.P&M machines are known to be registered in some 35 countries. I love this aircraft for its easy handling, economy, flexibility and rugged nature. The wing can be trimmed with great accuracy, and the hand throttle allows one to let it fly hands "off". At a 65mph (100kmh) cruise it burns 12litres per hour. It can sustain 95mph (150kmh), but it's a firm and thristy ride. It will get mushy at 38mph (48kmh) but you have to really hold the bar back to force a stall. It can carry all a touring pilot needs for a two week, autonomous adventure. It only needs 150m to get into, or out of, a small strip. I have put them onto harvested wheat fields, mountain pastures, and sandy beaches: and got out again. You can read the full specification here. I have owned two of this type, both with the 100bhp 912S engine. At MTOW of 450kg this is 1hp for 4.5kg.So it climbs at 1250ft/min (380metres/min). You can read a humorous review of the GT450 below. The first aircraft was the 80bhp Quantum 15, also from P&M Aviation. P&M run a good Facebook page. It is updated regularly with interesting stuff. 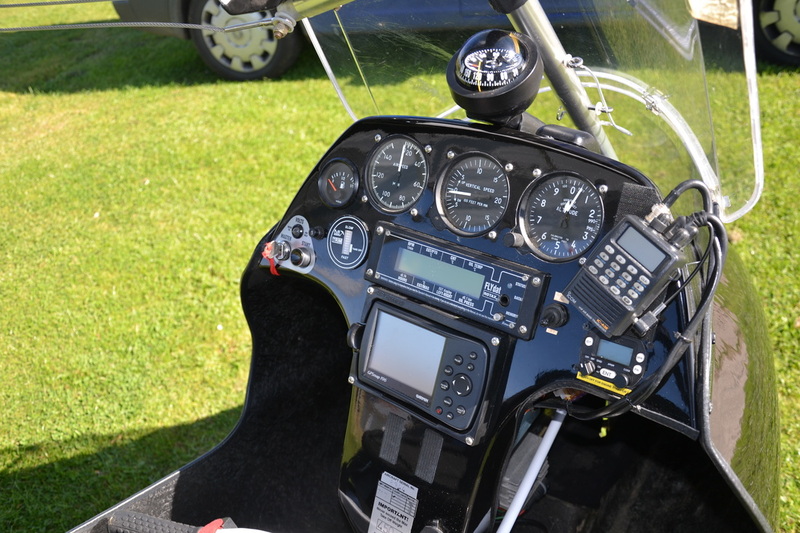 Upper (Left to right): Fuel Guage - Airspeed- Rate of Climb/Descent - Altimeter - Icom A4 radio. The windshield provides very good protection, and a (relatively) unbreezy cockpit. The left hand footwell has the steering bar for the nose wheel, and foot brake pedal that operates disc brakes on the rear wheels. The right hand foot well has the steering bar for the nose wheel,and the foot throttle. Trim switch and hand throttle are just out of the picture to the right. This is the Rotax 912S generates 100bhp from 1,352cc (82.5 cu in). 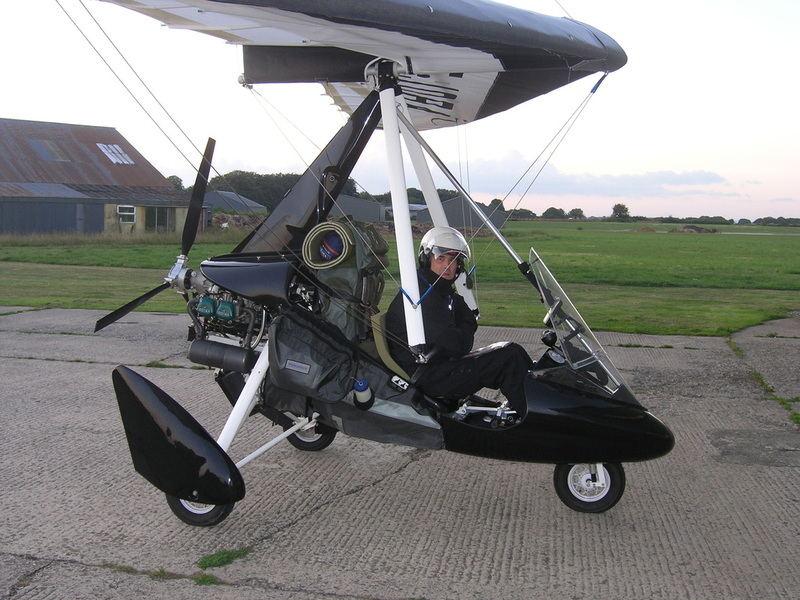 The proven aero engine for both flex-wing and traditional three axis microlight aircraft. Millions of safe hours flown. I've crossed up to 70miles (110km) of water with these engines. In over 1000 hours they have never missed a beat or failed to start, even after 6 winter months in the garage. At some £10,000 (12,500 Euro/USD) they are nowhere near the 'lawn mower' engines of the early days. If you like engines, start here. Firmly believing that flyers have an obligation to support those who make their living (a thin living) from microlighting, I leave everything behind and above the pilot to Jim Greenshields and Al Way, of Somerset Microlights and Bernard Bader.